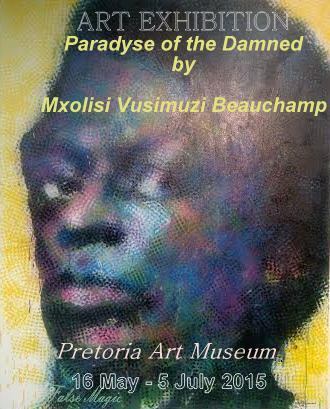 One of the most interesting, unapologetic and provocative contemporary artist of our generation, Mxolisi Vusimuzi Beauchamp, shows a new body of work in his home town this season. His solo exhibition opens in Tshwane this Saturday, 16 May, at the Pretoria Art Museum at 1030 for 11:00. The charm of Beauchamp’s present work is in its generous scale, laden with innuendo that straddles political commentary and our preoccupied mass consumer culture. The body of work exhibited under the title Paradyse of The Damned shoves the viewer around dizzyingly and then suddenly by the collar, enacting a paucity of self opinion in as far as the viewer’s opinions are concerned towards a re-reading/viewing of our global political sphere and mass consumer culture from afresh.